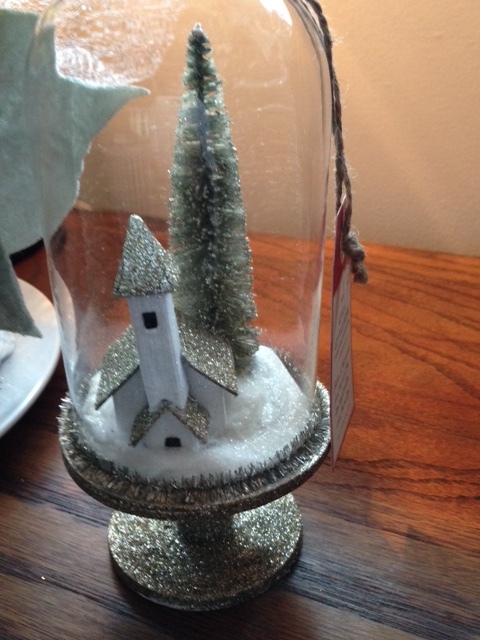 Grace lifted the lingering snow-globe, the last of the holiday decorations. She hesitated to put this one away. Safe underneath a cloche of glass, the miniature scene bespoke coveted memories. Be careful, they whispered. With a gentle shake of her wrist, tiny flakes began to tumble over the glimmering steeple. The tall structure sparkled as if lit by an inner light. Puffs of sugared snow drifted to settle around the base of the church, softening the straight, stern edges of the tiny building. Behind the church stood a tall evergreen, now dusted with sparkle. Two simple shapes, yet each held profound meaning to the woman whose hands cradle glass. Grace yearned to go back, return to the beginning, fix it. Life held promise; it made sense, was kind. She recalled the wedding photograph; the young couple laughed as they exited through the open doors of the quaint, country church. Light shone through them; their faces appeared lit from within, eyes shone forth hope. A tall, handsome man, earnest and true, steadfast with integrity. He tripped and fell. The glass shattered. Put it back together. Words easy to speak, harder to accomplish. An ocean rolled between us and seasons changed until it became, always winter. Grace clings too tightly to the past, protects the broken pieces. She keeps the shards in a locked box, cradled within her heart, takes comfort from the pain now layered upon her being. There is merit in learning compassion the hard way. Still~ to know one was loved. Isn’t that what we all wish for? An unbreakable connection to another. Walk away, be silent, let it go. The still setting under glass rests upon the oak sideboard. Grace glances at the snow-globe. The contents remain calm and silent, protected underneath the cover of a fragile dome. Emotionless. Time has honed her senses. She appreciates beauty; notices frost patterns that tattoo the earth; shrinks when the warmth of the sun kisses her cheek. That’s what happens when you believe in happy endings. Grace will find herself surrounded by evidence of love. She will always wonder. This is beautiful, Grace. You captured love and compassion in such a delicate way. Aw, you’re welcome, Grace. It’s a good piece of writing and I could feel the fragility in the weaving of your story through the snow-globe. Gorgeous imagery as always – I love the ‘frost patterns that tattoo the earth’ – and the sense of fragile hope that comes through in the writing. Thank you, Andrea. I may rewrite parts to “show” more, less “tell” and work on the ending as I just “dropped” it! I like the simple juxtaposition of the snow globe and the wedding photograph. Especially how the narration shifts there. She becomes completely objective when describing the “young couple.” I like the sense of detachment she feels from her past, while at the same time, she can’t prevent herself from clinging “too tightly to the past.” A bit of paradox. Very clever.